Favored by most feng shui masters, the windchime is known to be the easiest way to remedy bad star numbers in any living space. 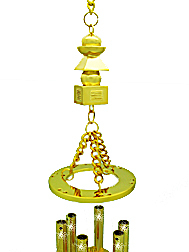 Leading to new perspective in the design of windchimes, this enchanting windchime has an actual sparkling 2-inch Five Element Pagoda as its leading piece. Consisting of 6 molded mantra rods inscribed clearly with the all-time-favorite "Om Mani Padme Hum" and gilded with gold, it provides a special channel to the cosmic realm to invoke divine help to transform bad energies into good vibes. 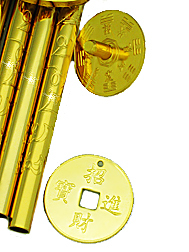 The center piece and the weight below remains unboldly traditional with the "bagua chao chye coin", which has proven its ability as a booster to counter pesky star numbers. 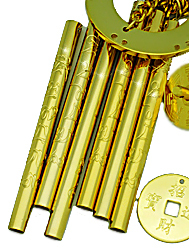 The six rods actually denotes "Chien Hexagram" from the studies of I-Ching which carries the meaning Big Metal and luck from heaven. This hexagram exerts the strongest form of metal energy which is required to counter problematic earth energy from flying stars #5, whether they are of natal, annual or monthly nature. 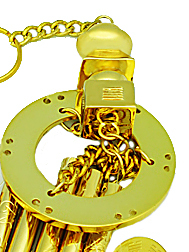 The deadly #5 Yellow brings fatality and bankruptcy if not remedied.This windchime can also be hung in sectors where Mountain Star #5 and Water Star #5 are from the birth chart of the house. Areas to focus on are particularly when #5 enters your facing or sitting direction of your house, the maindoor, the kitchen, entrances frequently used, the center and the bedroom. 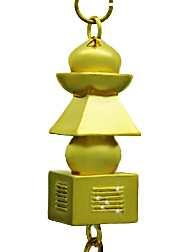 Windchime like bagua is a fundamental tool used in authentic Feng Shui. 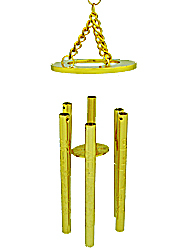 The advantage of a windchime is it can be use internally to dissolve shar chi. 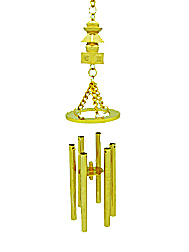 Windchimes are unquestionably the most powerful enhancer and cure for many Feng Shui situations. 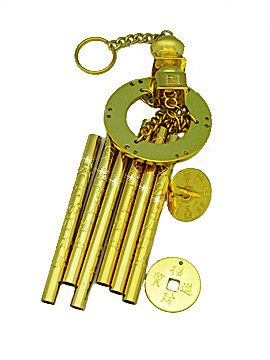 Windchimes are potent enough to maneuver and enhance chi wherever it is placed. They make a significant presence especially for those who do not want to spend too much money to modify buildings and large structures due to bad Feng Shui. Properly designed windchimes according to the rules of the nature do not invite ghost, but instead will chase away evil spirits with the melody of metal energy. The all time favorite mantra "OM MANI PADME HUM" is from the Goddess of Compassion Kwan Yin. The Goddess of Compassion (Avalokitesvara) will help you overcome sickness, family problems, relationship problems, career problem, conceiving problem, children problems, overcome death of loved ones, all forms of stress, examination problems and other types of bad luck. Besides overcoming problems, the mantra can also bring about good luck and protection. Mantras are actually powerful scriptures that invoke spiritual guardians or divine help in times of need. They are the sacred version of positive affirmations that work wonders in times of uncertainty, danger and weakness.